The Bellari Home Remodeling Party Deck is a fun way to entertain clients, employees, family and friends with an extraordinary view of the game and great food! Upscale menu includes one beef entree, one chicken entree, one pasta entree, tossed salad, rice, potato, dessert, and coffee. 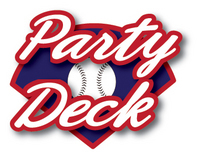 Click Here For Party Deck Menu Ingredients!